The Southern African Development Community (Sadc) has acknowledged efforts by President Mnangagwa to address economic and social transformation since ushering in the Second Republic. The regional grouping at the weekend was apprised of the situation in the country, on the back of recent violence sponsored by the opposition and non-governmental organisations (NGOs), and decried attempts to destabilise the country. Sadc says sanctions imposed on Zimbabwe by the West should be lifted. 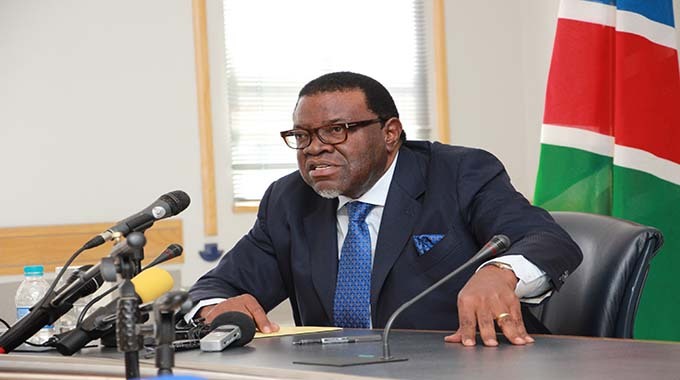 In a statement yesterday Sadc chairperson and Namibian President Dr Hage Geingob revealed that Southern Africa rallied behind Zimbabwe. “The consultative meeting of the Southern African Development Community (Sadc) Heads of State and Government, held on February 9, 2019, received a briefing from His Excellency, Mr Mnangagwa, and President of the Republic of Zimbabwe on the current political and socio-economic developments in the country,” said Dr Geingob. Dr Geingob said the Sadc Heads of State and Government had also noted that in an effort to address economic challenges in the country, the Government recently increased fuel prices and violent demonstrators rode on the back of the increases to implement their intention to destabilise the country. Sadc said the demonstrations resulted in the destruction of property and loss of life. “Sadc condemns in the strongest terms, the violence that ensued and expresses sympathy with the affected families for the loss of their loved ones and their properties. Sadc expressed its solidarity with the Government of the people of Zimbabwe, and called upon the international community to unconditionally lift all sanctions imposed on the country. The Sadc Heads of State and Government also noted that the Government has commenced dialogue with all stakeholders in the country with a view to strengthening economic transformation, and called upon all stakeholders to support the process. Dear Mr. President, you do not speak on my behalf. The crimes against humanity cannot be condoned. Why would the West lift sanctions? The President wants sanctions lifted so that he can continue his RICH lifestyle. He is directly responsible for stealing from his own people and reducing the country into ruins. This country was given at independence in a VERY enviable state. It was the bread basket of Africa. Look at it today. The President has completely broken everything in the country. Shame on the President.